A variety of books have been set aside on a cart for you. The books are on reserve so they will be available for both your library sessions. Cite books as print sources with the information contained on the title page and verso, or enter the ISBN into the shortcut for a ready-made citation. Both WorldBook and Britannica have 3 levels of information to chose from. ​You will need passwords to access these resources from home. See the orange bookmark. WorldBook has a timeline generator if you decide on that option. For EBSCO databases, start with Explora or Academic Search Premier. If you are looking for your required primary source, select primary source documents from the list of sources on the left hand side. Start with a general search and focus on the reference sources. To find a primary source, do an advanced search and select primary source from the content type menu. Biography in Context is a good source for information on the people in the French Revolution. Cite these sources depending on what type of source they are and start by indicating that you got them from a database. Most of these sources have ready made citations for you. The US Library of Congress has a collection of images from the French Revolution. Please refer to the library website page that shows how to find, use and cite copyright friendly images for your project. Cite all these freely available digital sources according to the type of source. Start by indicating that you go it from a website. Then select, webpage, video clip, image or other, depending on the type of source it is. Figure 1. 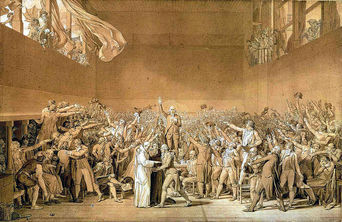 Tennis Court Oath by David Jacques-Louis. Wikimedia Commons.